I tend to be someone who thinks the middle path is the best path to take in life. In other words, nothing should be done in extremes and moderation is best. When it comes to fashion, however, I sometimes have trouble sticking to this maxim. Not too long ago, gigantic handbags were all the rage. I tried to resist this trend as best I could, sticking as I said before, to the middle path and opting for the practicality of medium-sized bags. Also, I'm not exactly a pack mule when it comes to what I carry around with me, so why would I need the space? This year, mini or micro bags are all the rage. I tried to resist this trend, but let's face it, these teeny tiny bags are just too adorable with their diminutive stature! I just couldn't say no. As I said before, I don't carry all that much around with me when I go out, so a little bag isn't too inconvenient. As long as I have room for my phone, my wallet, and maybe a tube of lipstick, I'm happy. This bag I am wearing today from Sophie Hulme should fit all of the above, as long as your wallet and phone aren't oversized. One of the things I love most about the adorable mini size of these micro bags is that designers have decided to make them in a delectable array of colors. 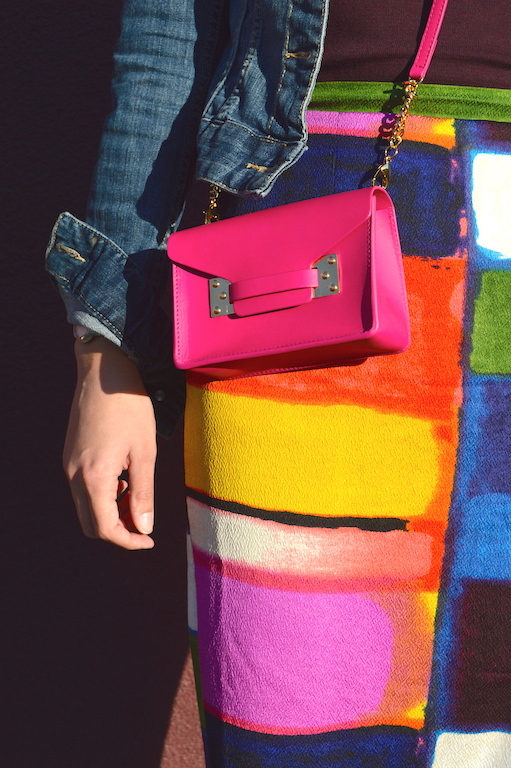 The Sophie Hulme bag I am wearing is a brilliant fuchsia color, which suits my love of color perfectly. 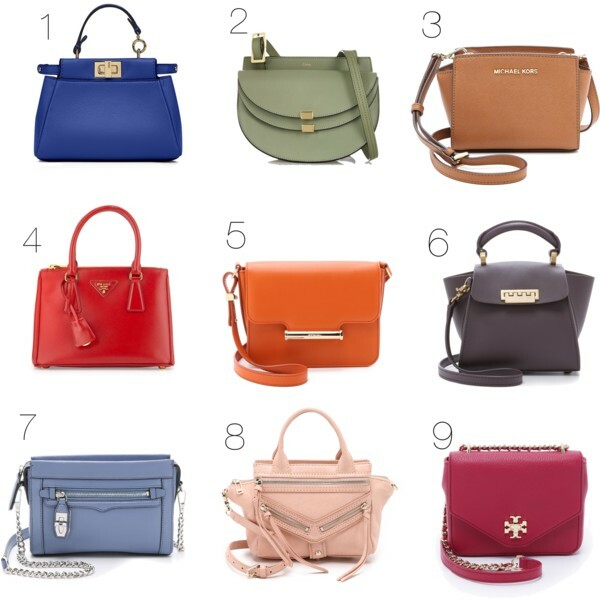 Below I've selected some mini bags in fun colors that are perfect for the Fall/Winter months. I agree with the comment above - that skirt is absolutely incredible! It looks perfect with your darling bag! And as for mini bags...I want to buy them all, They're so cute! But I hardly ever use them. I carry entirely too much junk around when I go out and mini bags only seem to work if I'm going to a dinner or something. :) I really need to work on not bringing so much stuff with me! I love love your skirt Katie! 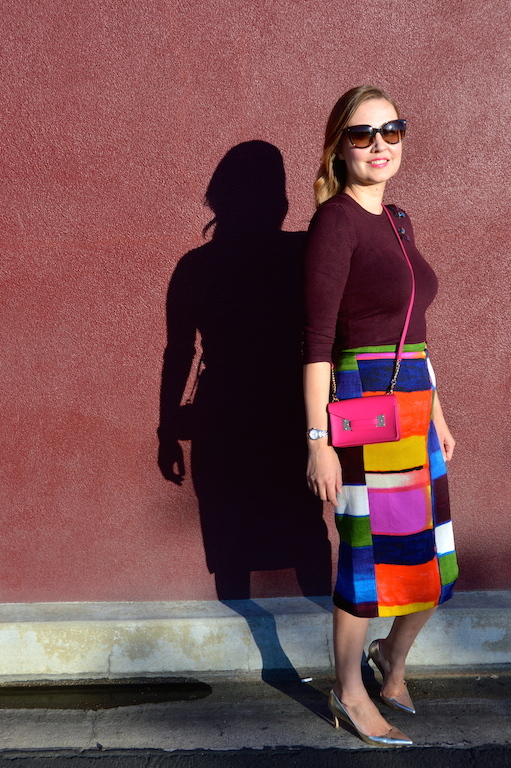 All of the colors painted on almost looks fantastic with the merlot sweater, I love the small bag, and have considered one myself. I find that some of my larger bags I just dont need all of that space! You look great! I've not yet mastered the trick of carrying only the bare essentials. My bags carry everything and the kitchen sink! However, the colour is gorgeous and the skirt - swooon - just swooon. 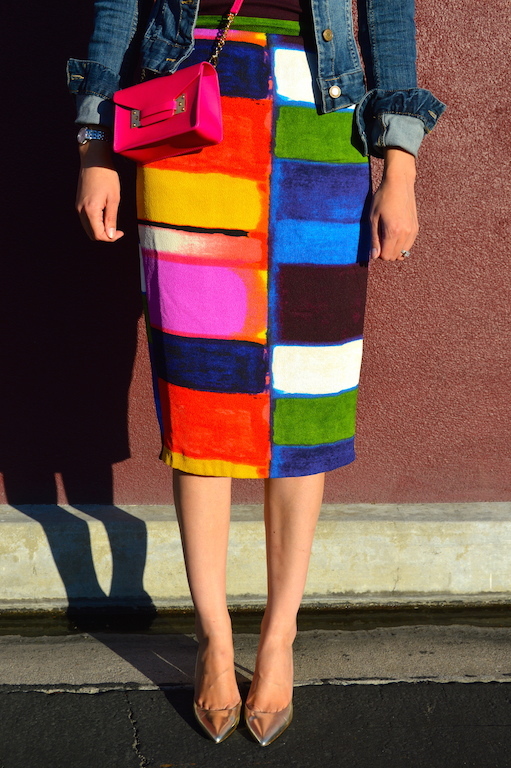 Gorgeous bag Katie and I love it paired with your lovely colorful blocked skirt, what a cool pop of color it adds. I wouldn't be able to resist this trend of micro bags either. It is perfect to carry the necessities. You have a gorgeous one and featured some more beautiful options. too. That sweater is so pretty. Happy Friday the 13th Katie! 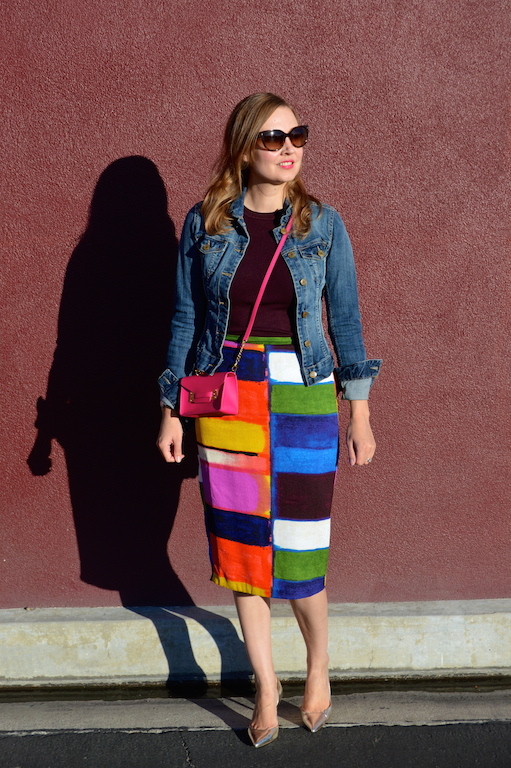 This skirt is incredible! Wow! And I love the tiny bag. It's adorable! 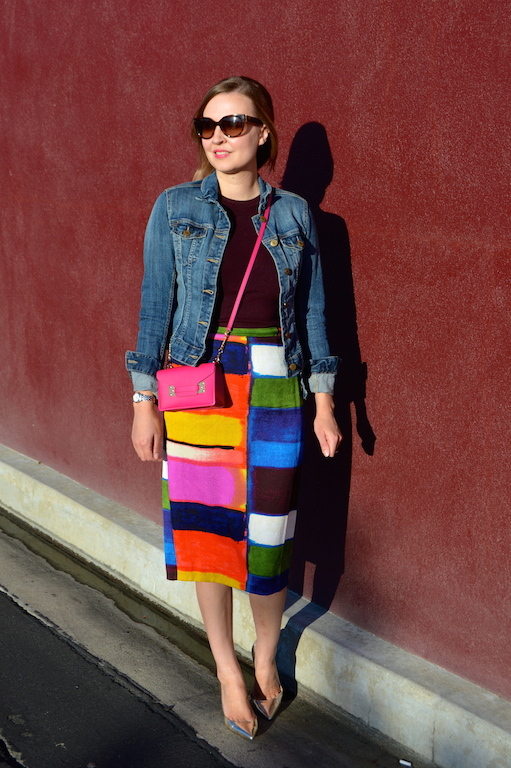 Sure the bag is adorable, but that skirt …!!!! Wow …. LOVE! I'm one of those everything-but-the-kitchen-sink gals, so I could never deal with a tiny purse. So cute though! You have the most beautiful collection of skirts. I have been tempted with these cute mini bags since I do carry a ton of things with me. They are fun and so much better for your shoulders too.